This CellMl model runs in OpenCell and COR to recreate the same steady state output of the original published model (as seen in in figure 5(d)). The units have been checked and they are consistent. The CellMl model represents the deterministic version of the follicular automaton model. Currently CellML cannot be used to describe stochastic variables. ABSTRACT: Human scalp hair consists of a set of about 10 to the 5 follicles which progress independently through developmental cycles. Each hair follicle successively goes through the anagen (A), catagen (C), telogen (T) and latency (L) phases that correspond, respectively, to growth, arrest and hair shedding before a new anagen phase is initiated. Long-term experimental observations in a group of ten male, alopecic and non-alopecic volunteers allowed determination of the characteristics of hair follicle cycles. On the basis of these observations, we previously proposed a follicular automaton model to simulate the dynamics of human hair cycles and the development of different patterns of alopecia [Halloy et al. (2000) Proc. Natl Acad. Sci. U.S.A.97, 8328-8333]. The automaton model is defined by a set of rules that govern the stochastic transitions of each follicle between the successive states A, T, L and the subsequent return to A. These transitions occur independently for each follicle, after time intervals given stochastically by a distribution characterized by a mean and a standard deviation. The follicular automaton model was shown to account both for the dynamical transitions observed in a single follicle, and for the behaviour of an ensemble of independently cycling follicles. Here, we extend these results and investigate additional properties of the model. We present a deterministic version of the follicular automaton. We show that numerical simulations of the stochastic version of the automaton yield steady-state level of follicles in the different phases which approach the levels predicted by the deterministic equations as the number of follicles progressively increases. Only the stochastic version can successfully reproduce the fluctuations of the fractions of follicles in each of the three phases, observed in small follicle populations. When the standard deviation is reduced or when the follicles become otherwise synchronized, e.g. by a periodic external signal inducing the transition of anagen follicles into telogen phase, large-amplitude oscillations occur in the fractions of follicles in the three phases. These oscillations are not observed in humans but are reminiscent of the phenomenon of moulting observed in a number of mammalian species. Copyright 2002 Elsevier Science Ltd. 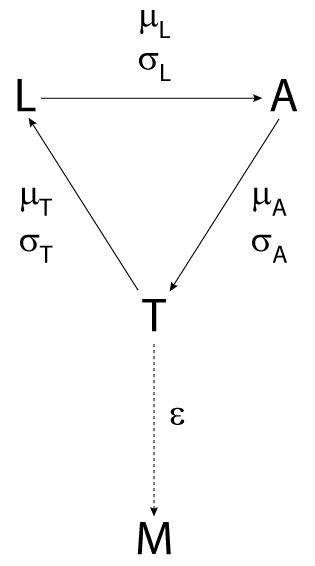 The above diagram represents the transition of a model hair follicle from anagen (A) to telogen (T) to latency (L) phase, successively. After phase T, the follicle may either die or miniaturise (transition to M; this usually occurs after a critical number of cycles), or complete a cycle by entering a new A phase. Derived from workspace Halloy, Bernard, Loussouarn, Goldbeter, 2002 at changeset 4f0f8ee4770c.